Dramatically expanding the use of natural gas to generate electricity creates numerous and complex risks for our economy, our health, and our climate. The U.S. electricity sector is in the midst of a major change. As power producers retire aging coal plants, they are turning to natural gas to generate electricity at an unprecedented rate. 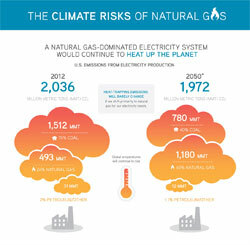 While this rapid shift is providing important near-term environmental and economic benefits, strong evidence suggests that becoming too reliant on natural gas poses numerous and complex risks, including persistent price volatility and rising global warming emissions. Analysis shows, however, that the dangers of an overreliance on natural gas can be overcome by greatly expanding the use of renewable energy and energy efficiency in our power supply. These technologies are already ramping up quickly across the country and demonstrating that they can deliver affordable, reliable, and low-carbon power. With sensible policies in place, these technologies can flourish and natural gas would play a useful—though more limited—role in a clean energy system. Utilities are increasingly choosing natural gas over coal for meeting electricity demand, a trend driven by higher coal prices, sharp declines in natural gas prices, and standards aimed at limiting harmful pollution from coal-fired power plants. 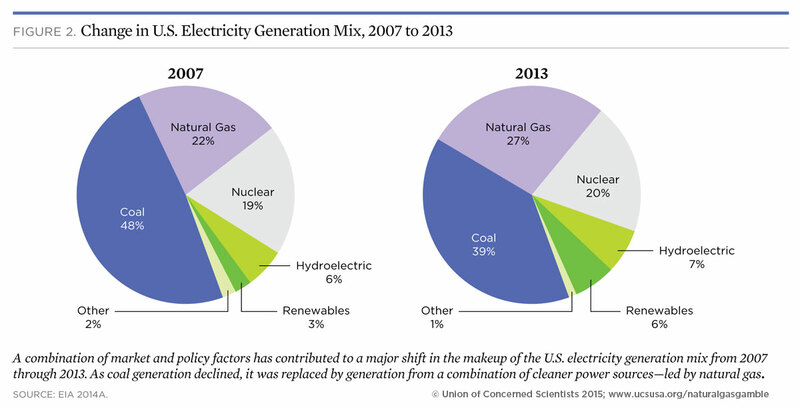 In just six years, from 2007 to 2013, coal's share of the U.S. electricity mix declined from about half to just 39 percent while natural gas generation's share grew from 22 percent to 27 percent. As more coal-fired power plants are retired in the months and years ahead, the choices utilities make to replace them will have major consequences for our economy, health, and climate for decades to come. Increasing dependence on natural gas for electricity generation sets up households and businesses for potential electricity price spikes. The natural gas industry has a well-documented history of price volatility due to the nature of its production, storage, and transmission; the fact that it supplies many end uses; and its susceptibility to extreme weather events. When natural gas prices rise, the elevated costs can contribute to higher electricity prices, especially in regions heavily reliant on natural gas. The increase in U.S. shale gas production has resulted in recent low prices for natural gas, but it has not eliminated price volatility—or the risk that prices could rise significantly in the years ahead. Like all fossil fuels, burning natural gas for electricity generation results in the release of CO2 and thus contributes to global warming. While smokestack emissions from natural gas combustion are significantly cleaner than coal, the global warming emissions from natural gas extend beyond power plant smokestacks. 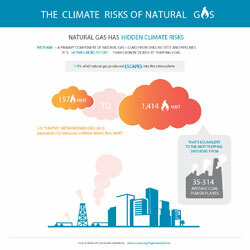 The extraction, distribution, and storage of natural gas result in the leakage of methane—a powerful global warming gas 34 times stronger than CO2 at trapping heat over a 100-year period—which diminishes the climate advantages of natural gas over coal. Furthermore, increasing our reliance on natural gas could delay the deployment of much cleaner renewable energy, putting us at greater risk of failing to meet the level of emissions reductions needed to avoid the worst consequences of climate change. Natural gas production, particularly hydraulic fracturing ("fracking"), also presents serious risks to public health and the environment. These include potential contamination of drinking water supplies by chemicals used in hydraulic fracturing and air pollution from natural gas operations. 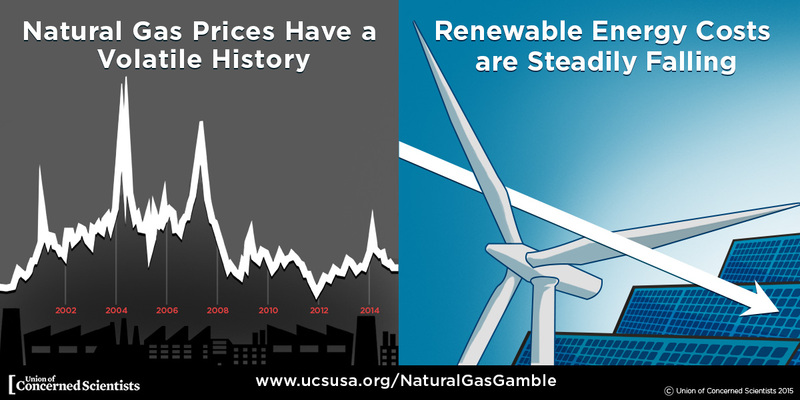 Unlike fossil fuels, electricity generated from renewable energy sources is not subject to price volatility. Once a renewable energy facility is built, the fuel — wind and solar power — is free, providing long-term price stability. What's more, the cost of electricty from renewable sources has been declining for years. In many locations, it is already cost-competitive with fossil fuels and is projected to become even more so in the years ahead. In addition, wind and solar power produce little to no global warming emissions and do not cause air or water pollution. As the nation moves away from coal, setting course toward a diverse supply of low-carbon power sources—made up primarily of renewble energy and energy efficiency with a balanced role for natural gas—is far preferable to a wholesale switch to natural gas. Analysis bears this out. 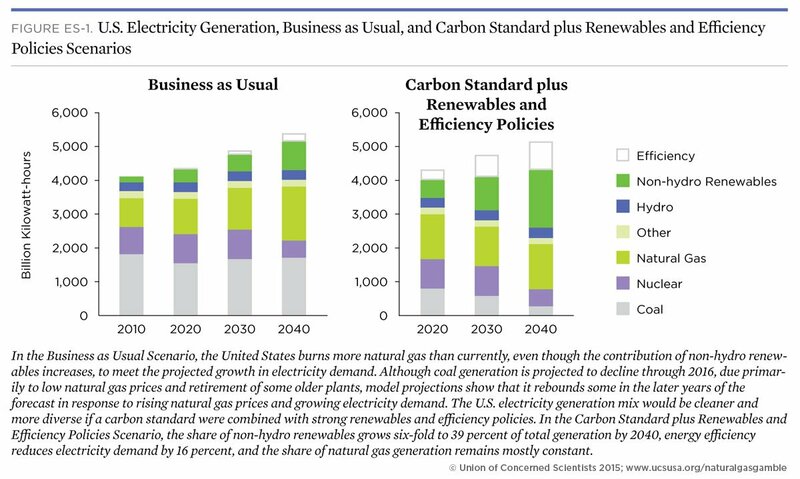 Continuing on a business-as-usual scenario—with no changes to existing energy policies—would put the U.S. on a pathway of greater natural gas use, rising carbon emissions, and higher natural gas and electricity prices. 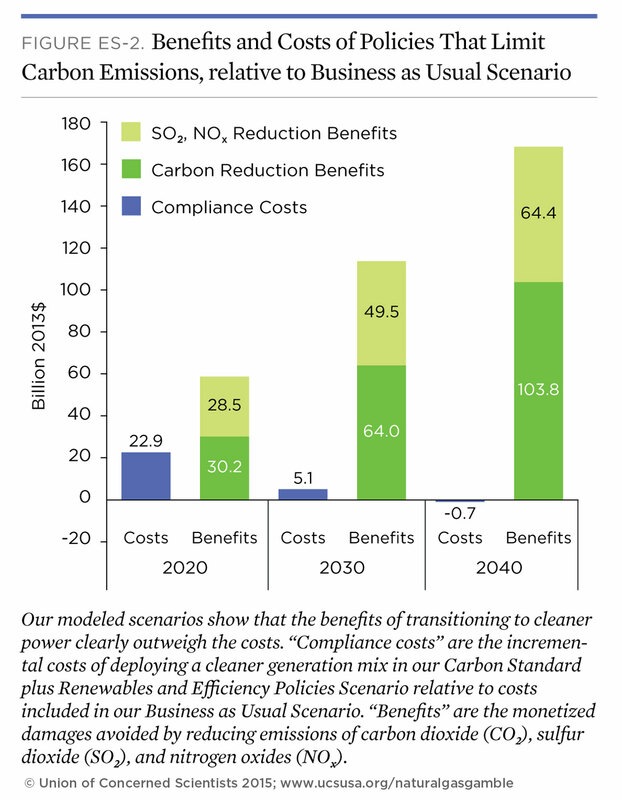 Net societal benefits from carbon and other harmful emissions reductions that are 2.6 times greater than the business-as-usual case in 2020, accruing to $36 billion, and growing to nearly $170 billion in 2040. Adopt and implement a strong federal carbon standard for power plants: The EPA should strengthen, finalize, and then implement the power plant carbon standards in its proposed Clean Power Plan. In addition, states should develop and implement strong compliance plans that prioritize the use of renewable energy and energy efficiency to meet as much of their emissions reduction target as possible. Strengthen and enact strong state and federal clean energy policies: Policy makers at all levels of government should adopt new or strengthened policies and programs aimed at hastening the deployment of renewable energy and energy efficiency, including renewable electricity standards, energy efficiency resource standards, carbon pricing programs, and tax and other financial incentives. Strengthen regulations for fugitive methane emissions and hydraulic fracturing: The EPA should develop regulations that establish technology-based methane emissions limits throughout the oil and gas supply chain, including new and existing sources. Strong state and federal laws are also needed as part of a comprehensive framework for monitoring, evaluating, and mitigating the potential public health and safety risks associated with hydraulic fracturing. Improve grid operation and resource planning: Utilities, regulators, and grid operators should work to modernize the U.S. electric grid as part of a transition away from coal toward a cleaner, more efficient electric system based on greater use of renewable energy, efficiency, and natural gas.